The series is inviting radio listeners to call in or post comments on the program’s web page about what best defines their changed experience of New York as a result of the building boom. This Wednesday such a call prompted an impromptu evaluation of the (AOL) Time Warner Center that really got us thinking. More on this and a trip down memory lane will be the main focus of our article after we dispense with preliminaries. Lehrer’s discussion this Wednesday involved as guests the New Yorker's architecture critic Paul Goldberger and architect Hugh Hardy, founder of H3 Hardy Collaboration. The series also incorporates videos posted on the site, including videos done by Mr. Hardy. Mention was made by Mr. Goldberger (3:25 ) of the importance of what isn’t now happening. That ties in with our April Fool’s joke of that same day concerning the Ratner Beekman tower near City Hall which has halted construction at about half its projected height. That halted construction is now the perfect epitome for an ongoing public debate: Given that it was going to be enormously tall and Gehry-esquely bizarre leaning over City Hall, how many people would actually prefer that the building’s construction never resume to make it any taller? Mr. Goldberg also specifically mentioned the disappointing inactivity at Ground Zero. . . an entire block has been dedicated to fairly mundane stuff; mundane because it just repeats and repeats and repeats without any specific point of view and it’s right next door to the lower east side jumble from the 19th century in which each plot had a different owner and a different attitude about what architecture was. HH: And every now and then there is gesture made to the past by pasting on a piece of masonry but it’s fairly half-hearted and no one is fooling anyone that somehow it fits into the context. PG: It becomes, unfortunately, a new context. PG: So the context we are trying to fit into is harder and harder to find. Hugh, I think you make a really wonderful point because in a lot of ways part of the problem today is that sites get bigger and bigger . . . It’s not just that buildings get taller. That’s almost the least of it. It’s that building plots get bigger and bigger and that variation you’re used to on the streetscape that makes it so wonderful to walk down a great old block in New York . . (“Exactly,” chimes in Mr. Hardy) . . IS GONE! BL: (7:30) So why, if you find. . If, Paul, you find the new glass, steel and big block buildings so much more ugly, are they coming to predominate new construction? Is it. . Is it money and scale or is it that aesthetics have changed and you guys are out of touch? Or, what is it? PG: I think it’s a little bit of everything actually. There is no question, by the way, that the predominant change in the cityscape in this whole boom is not any single building project but the collective impact of all this glass. You know glass was really very beautiful when it was in contrast to stone. When they built the Seagram building and you had this glass gem with old stone buildings around it it was absolutely wonderful. It was like a jewel. Now, however, . . You can’t build a whole city out of glass. Something feels so brittle about it. And that’s where we seem to be going. Discussion followed about how Chicago had done a better job constructing with glass to generally higher architectural standards. They also discussed the extent of the market demand for glass buildings which is viewed as more pronounced for commercial buildings and is being questioned when it comes to residential. What Paul was saying before about street life here- Streets are the glory of the city. It is the experience you treasure. And I think there is a different experience at street level than there is when you view these things at a distance. And, by and large they are critically received only as objects in the distant view whereas, in fact, you experience them when you walk about the street. And there is a tremendous difference when buildings acknowledge the grid and play with it and those that do everything possible to violate it. Well, I think it is important to keep both the small-scale stuff and the larger. It’s the juxtapositions that are so characteristic of New York. I’ve always enjoyed big tall buildings next to little tiny building. It’s the uniformity I think we are all objecting to. You don’t want to walk down a street and have it the same at the end as it was at the beginning. That makes journeys around here extraordinarily long and depressing. The parts of the city where everything is uniform, you don’t associate as Manhattan or any, any. . . That’s why movement to Brooklyn and the small scale of Brooklyn is such a delight after you’ve been confronted with the developments here. It’s the juxtaposition that we, I think, need, and of course, the way landmarks works its either/or. Now we get to what we most want to talk about. 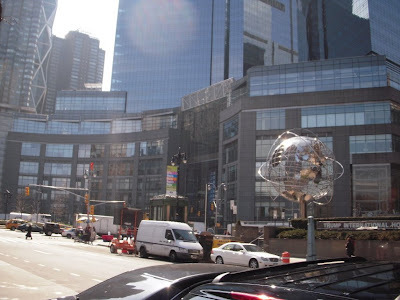 I was all prepared to hate the Time Warner Center before it went up but I must say I think it has done really a great job of making that area a focal point in the city, and a real magnet, and that’s not only because I come down on the A Train and that’s the first place I do a lot of things. So, that’s a great thing. I think it’s an elegant building despite all the glass. But the thing that disturbs me is the hideous kind of. . . I can’t even call it Bauhaus. . faceless stuff that’s going up like that one skinny building, I think somebody referred to, on Union Square; Union Square which had a couple of absolutely exquisite buildings. It’s not that one wants uniformity. You can’t build the same kind of building but it would be nice if there were some kind of harmony rather than this gaudy cheap stuff. I think the Hearst building is a much better piece of architecture, but I have to admit that the Time Warner has, as Marsha said, had a pretty positive effect on things. So it’s that frustration architecture critics always have when they have to admit that real life sometimes trumps quality architecture. Well, Time Warner, of course, has something, public access and in the Hearst Building you don’t. It’s an extraordinary interior, but you can’t get in to see it if you are just walking down the street. We have a problem with this impromptu assessment of the Time Warner center. 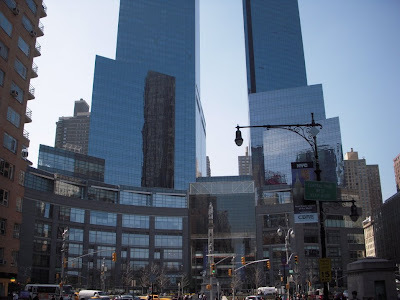 One of the major projects constructed during the boom, the (AOL) Time Warner Center may be thought of as having greater importance because it is the first major building to be completed in Manhattan after the September 11, 2001 attacks (though it was under construction beforehand). 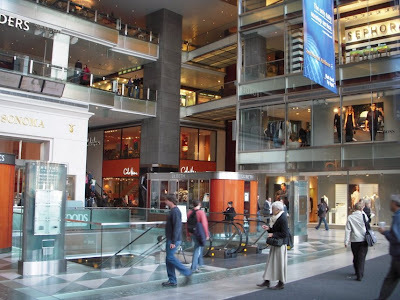 When you look at something like the Time Warner Center, which we don’t particularly like, you have to evaluate it not in terms of what it is, but in terms of what it could have been. This is something that is hard to do. Yes, the Time Warner Center is a net positive over the Coliseum that it replaced, but its bland generic mallishness is nothing like the much greater net positive that it could have been. That comparison is necessarily the real yardstick against which to measure of its success. For instance, we consider that the Brodsky Organization’s design to replace the Coliseum, which lost out to Related’s bid to build the AOL/TW Center, would have provided a better base design with which to start. We do admit, however, that the TW Center, at 750 ft, is superior to what was previously proposed to replace the Coliseum. The MTA had it in mind to go up to 130 stories. 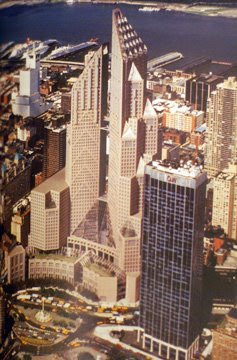 (See: Supertail Buidlings: Dreams and Realities, by Michael Decourcy Hinds, September 30, 1984) Donald Trump said he wanted to go even higher with a 137-story building on the site. People ought to remember that developer Mortimer B. Zuckerman (Boston Properties) planned to build two 68-story (925 feet) Moshe Safdie-designed needle/prism towers at the southwestern corner of Central Park that would have transformed the park into a giant sundial. That plan, with an unusually high 18 FAR (though later reduced several times) was defeated after significant public opposition led by the likes of Jacqueline Kennedy Onassis and the Municipal Art Society. The AOL Time Warner Center, whose construction “topped out” in February of 2003, is the product of the re-bid of the site where the aforementioned Brodsky Organization’s bid lost out to the Related Companies’ bid. The original name of the center, now known as the “Time Warner Center,” was the “AOL Time Warner Center.” If you remember, at the peak of the tech bubble AOL was the company that was going to take over the world and was more important than Time Warner with which it merged. Now, of course, just a few short years later, it is as if AOL hardly still exists. Though the 750-foot Time Warner Center is an improvement over the 925-foot Moshe Safdie-designed needle/prism towers that were not built, the center is not so substantially different than the final downscaled version of that proposed Zuckerman project last on the table before redevelopment of the site was re-bid. This is perhaps not surprising since architect David Childs of Skidmore of Skidmore, Owings & Merrill LLP, eventually got involved in reworking the Safdie design for Mr. Zuckerman and, thereafter, when Related bid in the new round of competition, Mr. Childs, was working for working for Related. 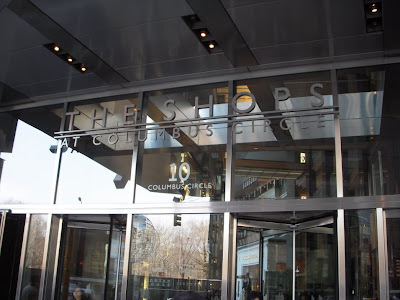 We note that Mr. Childs, is the same architect who was called in to “fix” the design for the building once referred to as the “Freedom Tower” at Ground Zero and, ironically in this context, he was recently appointed chairman of the board at the Municipal Art Society, the same organization that was important in opposing the original Zuckerman designs for the Columbus Circle site. Ah, the ironic insights that become possible when remembering back in time! What we have referred to above, based on our memory, as the Brodsky Organization’s bid was actually a coordinated submission from three developers: Bruce C. Ratner, Daniel Brodsky and Peter M. Lehrer. The architects were Schuman Lichtenstein Claman Efron also worked with Cesar Pelli & Associates. We like to remember that we were rooting for this submission because we regard the Brodsky Organization as one of the finest and most reputable developers in the city, but, facing facts, this takes us back to a time when we were actually rooting for a Ratner proposal. That despite the fact that we don’t currently regard Ratner as a good developer and, in fact, view him as more of subsidy collector than a developer. Want to see what we think was the better design? Try and find it on the web. We don’t think you can. 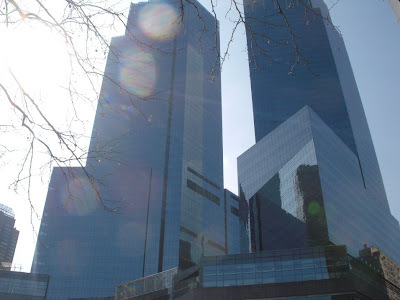 Concluding that the Time Warner Center should be evaluated more in terms of what it could have been rather than what it is, we went in search of what there is to permeate people’s consciousness in terms of what might have been instead, both good and bad. We would have loved to provide more visuals for this article. There is much less readily available than you would suspect, especially given that the contest over what would be constructed when the Coliseum site was redeveloped was a 15-year process that involved a lot of public contentiousness. Zuckerman’s Boston Properties original proposal was 1985. Demolition of the Coliseum did not occur until 2000. It is almost as if those 15 years of contentious public and political evaluation have disappeared. 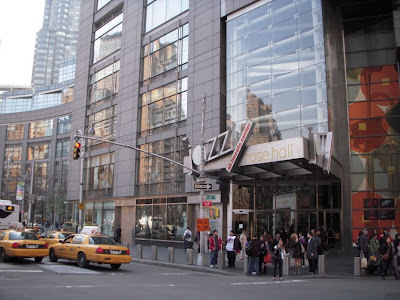 Maybe there is little that now permeates our consciousness helping us remember what could have been, but if we cannot remember, what could have been, then we are ill-equipped to assess the admittedly major impact the 2.8 million square foot Time Warner Center has had on the city. If you want to read one of the few evaluative efforts we find on the web that is accompanied by (a limited number of) images, you see: Where's Humpty-Dumpty? The New Coliseum Fiasco, By Carter B. Horsley, 7/30/98. That article contains the following images respecting only some of the second set of competitive designs being considered back then. It also includes the Skidmore rendering in the section above. We have couched this discussion in prejudicial terms. If you go to a sufficiently comprehensive library, you will be able to pull up out of archived periodicals past discussions of what should or could have been built at the old Coliseum’s Columbus Circle site. You can find images. If you are that kind of human being who (perhaps less bombarded by constant topical media and e-mails) just remembers things, then what we are writing here will not be unfamiliar. Still, for many of us the internet supplies us with our new digital brains, memory and consciousness. The bad news is that anything that occurred relatively recently, but before a certain date, now seems almost as if it no longer exists. A good example is New York magazine: Although New York magazine in on the web you can browse issues only as far back as 1998. Perhaps the good news is that the future will not be as susceptible to forgetting. No one in the future will ever forget or lose access to all the details of the Atlantic Yards fight when you have forever afterwards all of Atlantic Yards Report, No Land Grab and Develop Don’t Destroy’s websites, including many other permanent assets like Bob Guskind’s Goawanus Lounge. The plans like the Unity Plan and the Pacific Plan which are better far better alternatives to the Ratner designs for Atlantic Yards will not fade away as they will remain easily accessible on the web. By the same token, all the ways that the Ratner/ESDC lack of proper public process shortchanges the public will remain just a click or two away. It is doubtful that were the monstrosity of Atlantic Yards ever built, Paul Goldberger and Hugh Hardy would have a blithely forgetful conversion on Brian Lehrer’s program only eight years after the end of a development battle of so many years running. To be fair though, Atlantic Yards is bigger, much worse than the Time Warner Center since it is a net negative for the public rather than a net positive. Also, so far, unlike the AOL Time Warner Center, Atlantic Yards involves no competitive bids an no compromises from the developer! A “Time Warning” Question: Will We Be Different in the Future by Having a Different Past? Our take-away point with respect to the (once-AOL) Time Warner Center is that it is amazing that something from just a few years ago is so remote when we seek to refresh our memories in order to gain perspective on the present. We note, however, that things are changing with the new capabilities of the internet. With those new capabilities, we wonder whether the future will unfold in such a way that we have a quite different relationship with the recent past. In the future, perhaps 15 years from now, you might even find your perspective on what could have been versus what is shaped by revisiting the current Brian Lehrer series taking stock of what is happening to the built environment in the city. You may find your future perspective shaped when, listening to the series in the far future year, you are reminded that, in the month of April 2009, you phoned in or commented on the program’s web page to express your hopes about what the city could be.